Few movies have as original or weird a premise as Colossal. That premise: Anne Hathaway plays a woman who realizes she can occasionally spawn a real-life giant monster halfway across the world that acts as her avatar, mimicking her movements. If that’s kind of hard to visualize, the distributor Neon has just released the first teaser ahead of the film’s Sundance screenings. Here it is, courtesy of EW. Colossal is directed by Nacho Vigalando, the filmmaker behind the brilliant Timecrimes. Jason Sudeikis and Tim Blake Nelson also star in the film, which we saw back at its world premiere in September. Here’s our full review. You’ll get to see the film on April 7 when it begins to roll out in theaters and on-demand, and you definitely should. The crazy premise actually enfolds a very poignant, thought-provoking point, one which would be a sin to spoil at this moment. It’s nice, though, because the original Godzilla films were also about something, mainly a fear of nuclear war. Later films, such as the more recent remakes, got away from that in favor of pure spectacle. 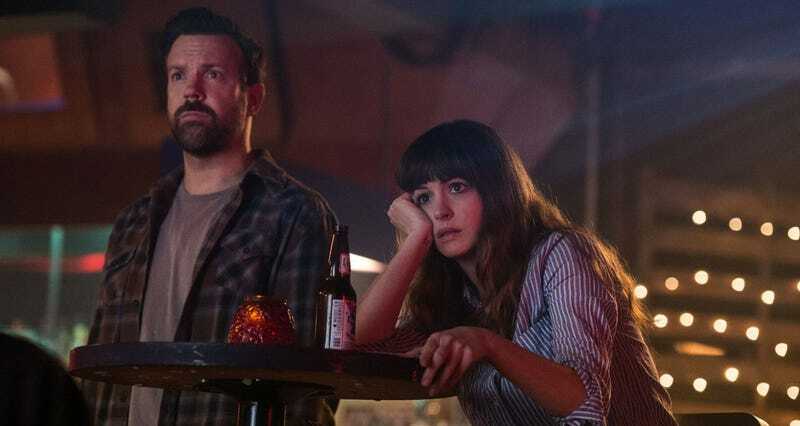 Colossal has some spectacle, but thematically it’s much more in line with the earlier films. That could make it a tough sell—but hopefully with Hathaway in the lead, people will actually turn out to see this super weird little movie.